Lenovo is planning to launch four of its all-in-one desktops for the Indian market by September. They have some nice hardware coupled with an improved cable management and new mounting options. The models are – Lenovo ThinkCenter E93z, E73z and M73z. The Lenovo ThinkCenter E93z is priced at $699 and is an ultra-thin business PC targeted at businesses. It is powered by fourth-generation Intel Core processors. It has 10 touch points that can be powered by a fourth-generation Core i7 processors. The PC also comes with a 1 GB Nvidia GeForce 720 discrete GPU on some models. The display is 54.6-cm and has infinity glass with full HD resolution. The Lenovo ThinkCenter M73z comes with enhanced security features with a TPM Security Chip for data protection and self-encrypting hard drive. It can be turned on from a remote location with the help of a keyboard along with a number of mounting solutions. The PC is powered by fourth-generation Intel Core processors and has integrated graphics and solid-state hybrid drives. It will be available in October starting at $439. The E73z will be available in the latter part of September with price starting at $599. The E73z and M73z are ideal for VoIP calls and video conferencing. They come with optimized 720p HD resolution cameras, arrayed microphones, and noise cancellation technology. Do ask if you can opt for discrete graphics and solid-state hybrid drives. These are offered on some of these computers. You could also consider buying the Lenovo ThinkCenter UltraFlex Stand with it so that your PC’s display can be adjusted through 360 degrees. The PCs come with better cable management too. 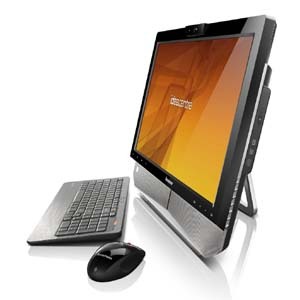 The computers also have WiDi support allowing them to be easily connected to notebook computers or other displays.